Above: An unusual map of part of the Strand – mainly plan but also showing the fronts of some buildings – published by Strype in 1720. It shows Exeter Change jutting out onto the pavement on the north side the Strand. Shopping is a a very popular pastime. If you think that the idea of shopping as only being a recent ‘leisure activity’ you would be quite wrong. The ‘pleasure of the shopping experience’ has been around since long before the 20th century. It probably goes back to the original idea of ‘getting a bargain’ and, as such, it therefore has very early origins. The idea of dedicated places to shop – like the so-called ‘shopping malls’ of today – are not new either. One of the earliest candidates in a list of the earliest forms of ‘shopping malls’ or ‘shopping centres’ in London would be old London Bridge where rows of shops actually built onto the stonework of the narrow structure became well-known among wealthy City residents for the sale of jewellery and fine clothes in the 14th century. The New Exchange, on the south side of the Strand, ranks as one of the earliest dedicated specialist groups of shops (for milliners and hosiers) in London, dating from 1608. The Royal Opera Arcade, off Pall Mall, was completed in 1818 and claims to be the world’s oldest existing shopping arcade – certainly one of the most elegant. Various large shops in London lay claim to being the first departmental store. Harrods opened on the Brompton Road in 1849. Selfridges, founded by Harry Gordon Selfridge, opened in Oxford Street on 15 March 1909. For even larger shopping premises, Brent Cross claims to be the first shopping centre in Britain, opening in 1976. Now that we have ‘set the scene’ of shopping, we will get back to the subject of this article – Exeter Change. Until the time of the Dissolution of the Monasteries (1536) the south side of the Strand was lined with large houses, with many of them in use as the London residences of Bishops. With the closure of the monasteries and the establishment of the ‘Church of England’, the bishops rather lost interest in their original function – being advisers to the king as ‘Lord’s Spiritual’ – and they sold off their large estates in the Strand to dukes and similar nobility. Until those times most of the north side of the Strand had been open land. It was in 1552 that much of the land which we now call Covent Garden was acquired by John Russell, the Duke of Bedford, and many wealthy families started to live on the north side of the Strand. By the 1600s both sides of the Strand were, in the main, the residences of the nobility – hence the need for shops. Above: Possibly the only view of Exeter Change from ground level. The drawing on the wall indicates that by the time of the print it was being used as a menagerie. 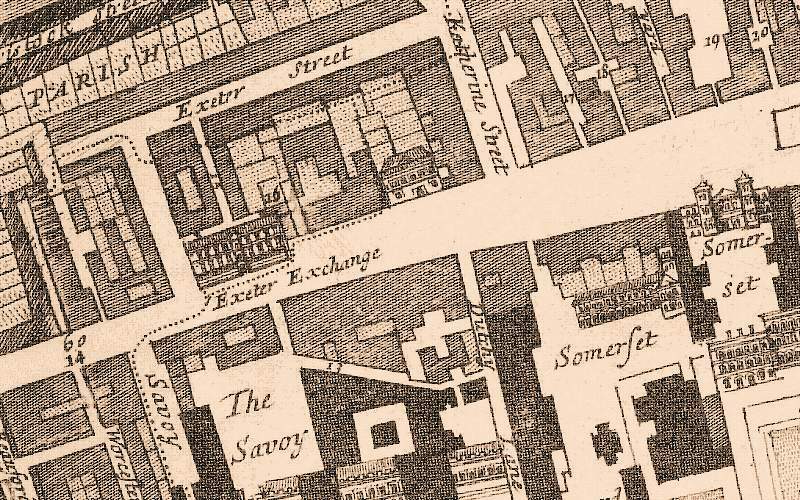 Exeter Change (more properly called ‘Exeter Exchange’) was built 1680 on part of the site of the demolished Exeter House (formerly Burghley House and Cecil House). 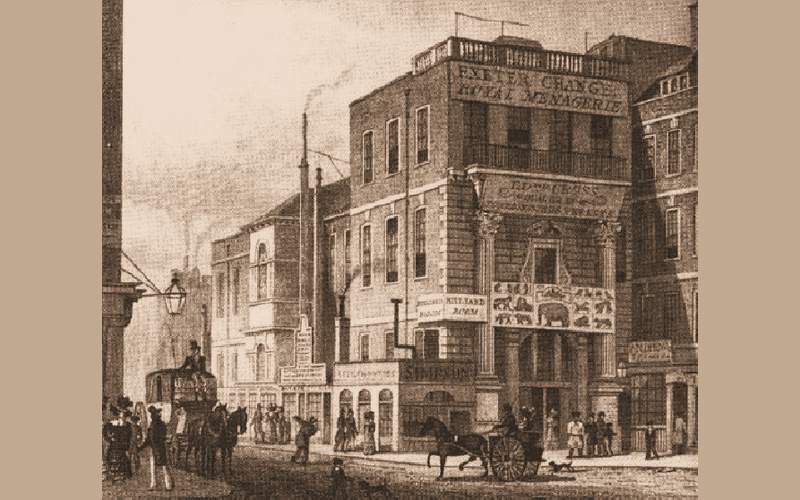 Exeter Change was an unusual building, whose southern side contained an arcade which was built over the pavement on the north side of the Strand. The three-floor building therefore had the appearance of ‘jutting out’ into the roadway. On the ground floor was an indoor arcade for seamsters, milliners, drapers and hosiers. The rooms above were let to the Land Bank. Over time the traders on the ground floor were replaced by offices, and the upper rooms were used for storage. The ‘shopping mall’ enjoyed great popularity and was to last into the 1750s. That was to be the end of the site as a shopping destination. From 1773, the upper rooms were let to a series of impresarios who operated a menagerie in competition with the Royal Menagerie at the Tower of London. The menagerie at the Exeter Exchange included (at various time) lions, tigers, monkeys, and other exotic species, all confined in iron cages in small rooms. It had been established by Thomas Clark but was purchased in 1793 by Gilbert Pidcock. It subsequently passed into the ownership of Stephani Polito. Both Pidcock and Polito were operators of travelling circuses, who used the Exeter Exchange as winter quarters for their animals. The menagerie was a popular visitor attraction. It was visited by Wordsworth and Byron. Artists including Edwin Landseer came to paint the animals. Above: The shooting of Chunee the elephant who had been ill and had become so violent it was feared he might break out of his cage. Polito died in 1814, and the menagerie was acquired by one of his former employees, Edward Cross. Cross renamed the collection the Royal Grand National Menagerie and employed a doorkeeper who was dressed as a Yeoman of the Guard. 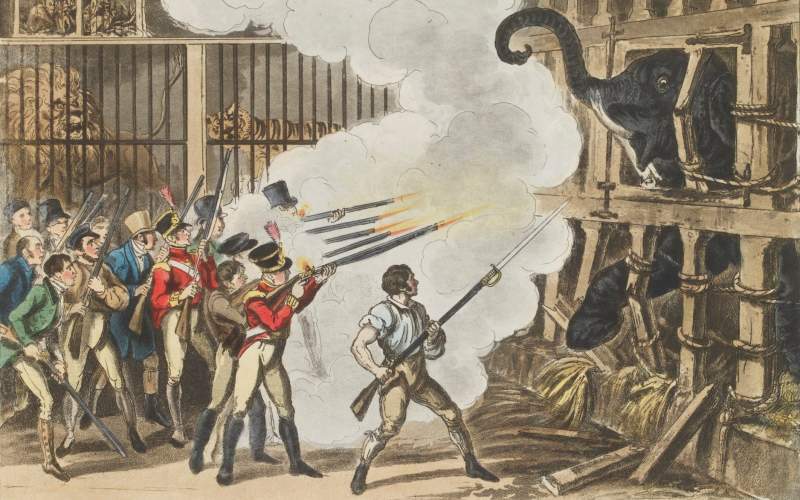 His bad-tempered elephant, Chunee, was shot there in March 1826 by soldiers from Somerset House. When the Exeter Exchange was demolished in 1829, as part of general improvements to the Strand, the animals were dispersed to the new London Zoo in Regent’s Park and also to Cross’s new enterprise at Surrey Zoological Gardens on land south of the Thames. Exeter Hall was built on the site of Exeter Change, opening in 1831 and surviving until 1907. It was a large public hall in which meetings attended by large crowds were held. The site is now occupied by the Strand Palace Hotel. Please note that ‘Exeter Change’ also called ‘Exeter Exchange’ should not be confused with ‘New Exchange’. Both were once in the Strand.